In a world where American Idol has been launching earnest singer-songwriters to fleeting semi-stardom for the past 13 years, it’s hard to still get excited about traditional singing competitions. However, if the continued popularity of Jimmy Fallon’s lip sync battles is any indication, we are very excited about seeing people we already know are famous pretend to sing. 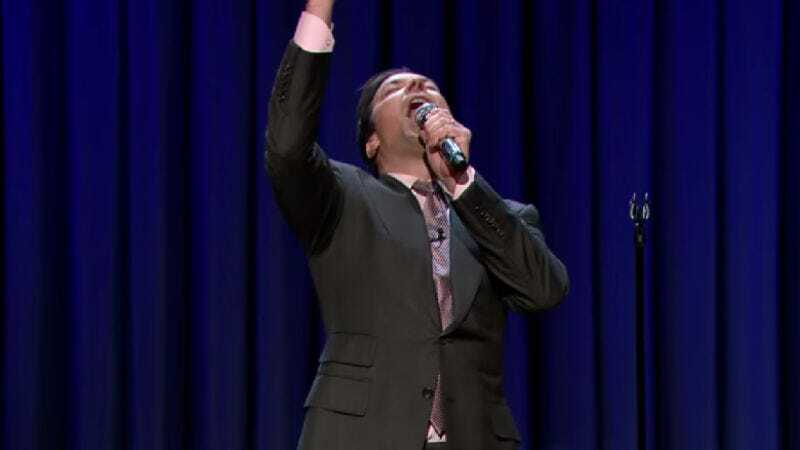 Now Fallon is hoping we’re excited enough to watch it for a half-hour every week as he readies a show called Lip Sync Battle to air on Spike TV next spring. To help him, Fallon has enlisted John Krasinski and Stephen Merchant, two celebrities with whom he engaged in particularly memorable lip sync-offs on Late Night With Jimmy Fallon. Each episode of Lip Sync Battle will feature different celebrities picking individual songs and going head-to-head in a battle for bragging rights. Fallon, Krasinski, and Merchant will serve as executive producers as well as performers. Announcements concerning a host for the show, a celebrity lineup, and how producers expect to stretch a segment that periodically fills up a few minutes of time on The Tonight Show out to a weekly half-hour are expected shortly.